Google Public Policy Blog: As Canada faces political upheaval, what are Canadians searching for? As Canada faces political upheaval, what are Canadians searching for? These are fascinating times for Canadian political junkies. Our minority Conservative Party government, re-elected just under two months ago, faces the possibility of being replaced by a coalition of the Liberal Party and the New Democratic Party (NDP), supported by the Bloc Québécois. 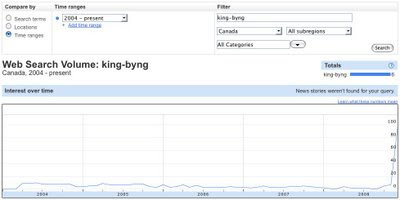 So what are Canadians searching for in this time of upheaval? 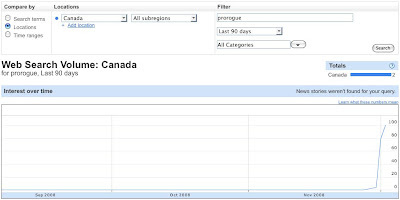 Not surprisingly, there's been a massive increase in searches for "prorogue." Until this month there's been almost no interest in prorogation — which is typically parliamentary esoterica rather than front page news. 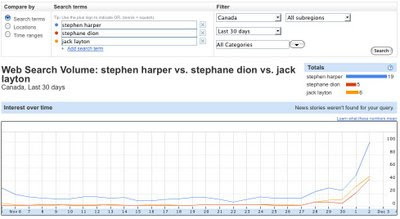 And not surprisingly, searches for "coalition," "coalition government," "ndp coalition," and "canadian government" have also spiked. However, the data also suggests we may not be as bilingual as we think. Many Canadians are misspelling the name of our Liberal leader and Harper's chief rival, Stéphane Dion, searching for "Stephen Dion" instead. Quel dommage!